Here in Florida, the Parkland community is reeling from the recent deaths by suicide of two student survivors of the Marjorie Stoneman Douglas School massacre which occurred on Feb. 14, 2018. On the heels of that double tragedy, the father of one of the first-graders murdered during the Sandy Hook Massacre succumbed to the weight of his grief and took his life this past weekend. Such is the weight of trauma and unbounded grief. Adoptees commit suicide at four times the rate of non-adopted persons.Such is the weight of trauma and unrecognized or invalidated adoptee grief. For too long, adoption has been considered totally benign, a perfect solution that solved a three-sided problem (a mother unable to parent, prospective parents in search of a child, and a child in need of a family). Adoption provided a fairytale ending for all. Except that the reality is far more complex than this idealized, sanitized version. Without exception, adoption is rooted in loss. 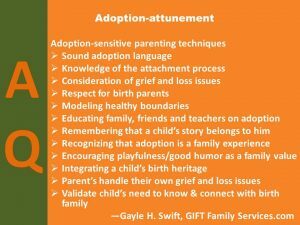 Unless those losses are acknowledged, appreciated and voiced, great emotional harm can be inflicted on those whom adoption purports to benefit. As Intentional Parents we must have the courage and compassion to help our kids by creating space for this reality in our hearts, minds, and conversations. We must talk with our children about the dualities in adoption. 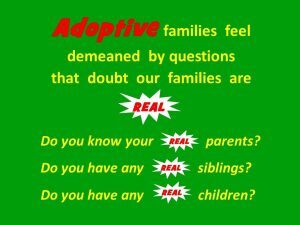 Reassure them that we understand that adoption brought our greatest joy but that for them adoption is a two-edged sword. It provided them a family that loves and cherishes them but before our families could be created, their original families had to be broken. For our children adoption will always include a degree of loss and grief. If we do not acknowledge this reality, if we expect total allegiance to us and total severance of their affection, connection, and interest in their birth families, if we live as if adoption is a fairy tale, we burden our children with the weight of unacknowledged grief. When they cannot share the weight of their grief and distribute it across the shoulders of family who love them, adoptees can be overwhelmed by it. Left to shoulder their grief, fear, loneliness, rejection, and sense of isolation many will turn to suicide as a way to achieve relief. Adoptive parents must have the courage, compassion, and attunement to hold adoption complexity, to steep themselves in a Both/And reality that allows our children to express their emotions—all of them—not just the easy, positive ones, but also the heavier, more devastating and scary ones. We can rise to the challenge of adopted parenthood, embrace the ambiguous losses and lean on one another. The truth of adoption is not rainbows and unicorns but it can be about coming together to love one another through a complex reality that makes room for multiple connections, emotions, and truths. Denying these complexities isolates our kids and increases the likelihood that they will be crushed by the weight of their grief. That is a price too high to pay and must be avoided at all cost. Keyes MA, Malone SM, Sharma A, Iacono WG, McGue M. Risk of suicide attempt in adopted and nonadopted offspring. Pediatrics. 2013;132(4):639-46. As we discussed in a recent blog, adoptive families are often questioned in one way or another about who the "REAL" relationship figures are in their lives. These questions land like a sucker punch to the chest. Sometimes we can quickly recenter ourselves and decide how we want to respond. At other times, their verbal assault knocks us off balance and leaves us reeling. Let me offer you a personal insight. As I've mentioned several times during the last year, my husband is in the end stages of a terminal disease and I am caring for him at home. My children have been stalwart throughout this process. Their bond with their dad is very REAL. They visit regularly and make an earnest effort to cheer their dad on and to enjoy time with him while they are able. They perform many kindnesses, bring him his favorite food treats and spend time with him. When I need help, they respond promptly and gladly. This makes me proud and appreciative. We are so lucky that they live nearby and are able/willing to help. 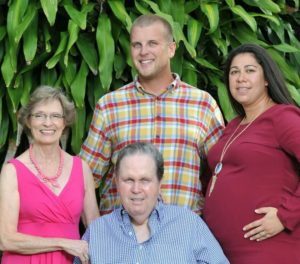 Terminal illness is a challenge for any family but the long slow, decline of a degenerative neurological disease is especially heartbreaking. The physical and cognitive losses are so difficult to watch. Seeing their robust and intelligent father decline so precipitously grieves me and my children in a viscerally painful way. I assure you their emotions and their attachments are very genuine. They love their dad and speak of how he parented and loved them well--humanly, imperfectly, deeply--and in a way they experienced as very REAL. Their best--and most REAL--expression of their bond with their dad is their actions. Since the 1980's when they were placed with us as infants, we've made a conscious and consistent effort to speak about their birth parents positively. We followed through on our promise to help them reconnect with their birth parents. (Years ago, they both took us up on our promise.) We consistently reassure them that we are NOT in competition with their birth families, that we consider their birth family relationships a vital and important part of their lives and, therefore, an integral and valued part of ours. As their parent, I am concerned for their emotional well being as we face this next chapter in our lives. How will they handle their anguish? Will it tear away the scab from the pain of their adoption-connected losses? Exacerbate their pain? How can I best support them? 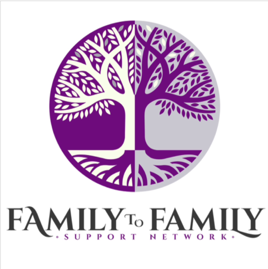 For adoptive families who have not embraced openness in adoption and who are facing an adoptive parent's death, children may experience an ambivalent, unsettling sense of profound grief and simultaneously feel that they now finally have the freedom to search out their biological family connections. That pairing of grief, guilt and relief make a painful emotional soup. I encourage families to commit to seeing both adoptive and birth families as REAL and important relationships in their children's lives. 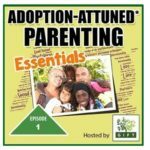 Make absolutely sure your kids know your adoption-attuned position. Reiterate your stance until you are certain they believe your inclusivity is genuine. Do not ask your children to choose between one or the other. Adoptees need all of their "parts." We must not expect them to choose between us. That kind of monolithic loyalty oath is too high a price to pay for a loving family. As Lori Holden asserts in her landmark book, The Open-hearted Way to Open Adoption: Helping Your Child Grow Up Whole openness does not directly equate with visitation; it is first and foremost an attitude of the heart. (Lori's book is essential reading for adoptive families and we have previously reviewed it.) Even if your adoption is not fully open, the underlying respect and value that you hold for your children's birth family is a foundational pillar of your attachment. To explore this concept further, read Lori's book. In conclusion, adoptive families and their bonds are authentic, REAL and significant. Don't let anyone imply otherwise. I've mentioned earlier this year that our first grandchild will be born any day. I've been caught up in the tidal wave of excitement along with other family members and friends. A wide swath of support and joy have surrounded the delighted expectant parents. At every level this baby is immersed in a community that oozes happiness at the prospect of his existence. When the baby is born, he will enter a world filled with familiarity because he's heard the voices of parents, grandparents, aunts, uncles and friends during these past months.The music and even the clatter of daily life will enfold him in a sense of continuity and safety. I simultaneously ponder how an adopted child’s gestation differs dramatically. His conception is startling, unplanned. A crisis. Emotions swing from joy to panic as the expectant parents frantically struggle to determine how to gather the resources necessary to parent their unexpected baby, or make an adoption plan for this precious life they’ve conceived. 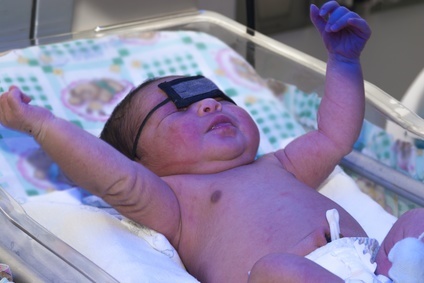 This emotional, dramatic and chaotic prenatal environment stresses the baby. The overwhelmed mother and father struggle with intense emotions, difficult decisions, advice from family, friends, counselors, social workers. Imagine for a moment what it is like for an expectant mother who is making an adoption plan when strangers notice, comment on and enthuse about how thrilled/excited, etc. she must be. Can you feel the razor blades of grief? The unborn baby does. And it shapes him. How can we adoptive parents prepare ourselves to be ready to meet this child's unique needs? 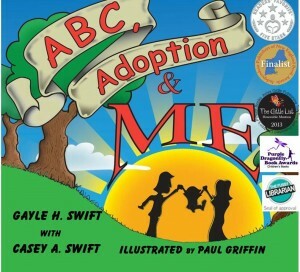 We must immerse ourselves in the world of Adoption-attuned Parenting. Skip Lamaze classes and learn about attachment styles and how they affect parent/child relationships. Learn about grief and loss issues--the child's and your own--so that their responses do not trigger your own hot buttons. Read widely. Listen to podcasts like this one from Family to Family in which Brina, a young birth mother, recounts her experience with open adoption. She shares how she made her decision, selected prospective adoptive parents, her labor and delivery experience and her life since placing her son. Very powerful and enlightening. Take classes. Adoption Learning Partners offers a wide selection of excellent ones on-line. They are offered on demand so you can fit them into your busy schedule. Read up on adoption. 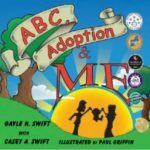 Choose books that recognize adoption-attuned concepts and strategies, that acknowledge grief and loss issues and prepare you for the unique experience of adoptive parenting. Be sure to include some that address the more difficult parts of adoption so that your child knows it is acceptable to discuss. Provide books that explore adoption from the child's point of view. This will help him see how other children think about their adoptions and will help him express his feelings to you. It will help frame his complicated feelings into words. Plus, it will demonstrate that you are open to talking about them and are strong enough to hold both his joy and his sorrow. Advances in neuro-biology have deepened our understanding of infant and childhood grief. Open Adoption, while not a panacea, does eradicate secrecy and reduce the shame that infused closed adoptions; it is worth exploring or pursuing. 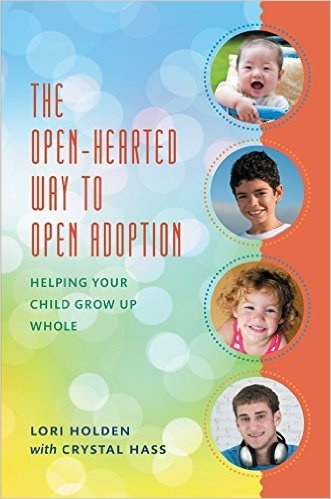 (Check out Lori Holden's book, The Open-hearted Way to Open Adoption. Gayle's review: Please refer to our website for an additional list of suggested resources and books that are some of our favorites. Educate yourself, your family and friends. Remember that "It takes a village to raise a child," so help your family and friends become adoption-attuned so they can support you and a child. Let them see that your decision is well thought, heartfelt and firm. Bring them into your vision and onto your family's team. Address their questions. 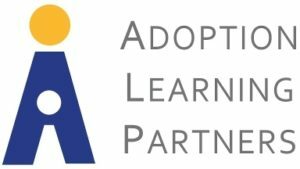 Just as adoption was a decision that took time to explore and choose, it may also take them time to accclimate to the idea. Let them know, that you want them to be a part of your child's life. 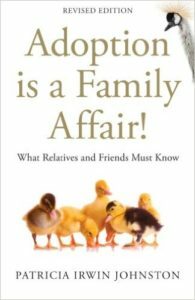 One excellent book is, Patricia Irwin Johnston's, “Adoption is a Family Affair What Relatives and Friends Must Know. Adoption is an important way to grow a family AND it comes with an additional level of responsibility. Our joy must not ignore the genuine struggles and challenges our children must work through as they braid their birth and adoptive heritages into a healthy identity. Parents often say they would do anything for their kids. Becoming adequately savvy about adoption is one thing all adoptive parents must do. Our kids need this. They deserve the best prepared parents, ones who love them enough to do the hard work, to hear the difficult truths and to commit that extra level of time and effort so they we can become the parents they need as well as the parents they want.